Stocks Unleashed: Tradewinds: The Shooting Star (RM8.23; Target > RM15) - A spectacular quarter!! Tradewinds: The Shooting Star (RM8.23; Target > RM15) - A spectacular quarter!! Tradewinds just announced its 4Q results on Thursday last week. Its performance was beyond my expectations and it's nothing short of spectacular. This led to its jump in share price by 67 sen, the top gainer on last Friday!!! Net profit for 4Q2010 stood at RM193.5 mil or EPS of 66.5 sen while its whole year's net profit was RM482 million or RM1.65 per share, way ahead of my forecast of RM400 mil. 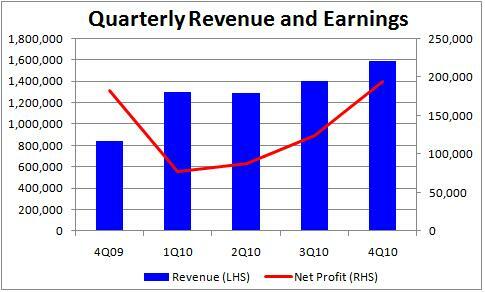 I really like their huge increase in turnover and net profit, almost doubled y-o-y (year-on-year). Revenue for 4Q 2010 and whole year of 2010 were RM1.6 bil and RM5.8 bil respectively. Their huge revenue also means that improvements in efficiency and cost control could result in huge increases in their earnings. 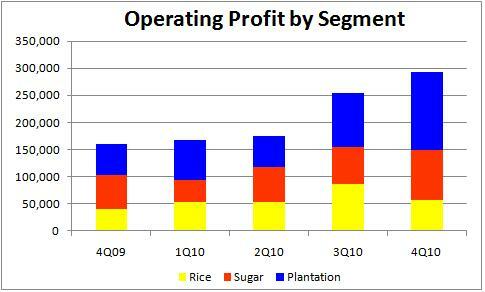 The increase in earnings was attributed to better earnings from sugar refining and oil palm plantations segments. Operating profit from sugar refining jumped from RM68 mil to RM93 mil while its plantation operating profit increased from RM99.4 mil to RM143 mil. Earnings from rice division remained solid and were slightly higher than its average in previous quarters at RM57 mil. Net gearing declined continuously from 1.08x in 1Q2010 to 0.83x in 4Q2010 which is good. Its high net gearing is not much of a concern in view of its resilient and lucrative businesses. Net assets per share rose from RM5.82 to RM6.83. Its plantation business is expected to fare well in view of the favorable palm oil prices coupled with its increasing matured acreage (Its tree age profile is rather young, means that there is plenty of room for expansion in production). According to its quarterly report, rice division is expected to perform well for 2011 despite a more volatile rice market as it has bought forward some of this year's requirements to mitigate the risks. On the other hand, sugar refining could benefit from sugar price increases resulted from subsidy cuts. In view of its prospects and strong earnings, I see a RM15 stock in the making. Its earnings were even more fantastic than Kulim's RM360 mil net profit for 2010. By simple calculation, if Tradewinds is to trade at similar PE levels as Kulim, its share price should be at RM20!!! For posts on Tradewinds, click here.